Courtesy Ben Stokes and Jos Buttler, England has finally put up a show in the Test series against the Windies. For the first time in this three-match series, the visitors seemed to have gained an advantage over the hosts. At stumps on day-1, the Brits finished with a total of 231/4. They’d clearly looking to take this first innings total at least up to 350 or more. The Windies won the toss and opted to bowl first on a green, lively deck. It still remains a puzzle about how the openers Rory Burns and Keaton Jennings survived for 16 overs. Kemar Roach and Shannon Gabriel were unstoppable in their first spell. With their defensive and low-on-confidence approach, the English top-three only made things look even worse. Edges fells short of the slips while there were many plays and misses. But, the fact is that England lost only one wicket in the first session. However, right at the start of the second session, the Windies bowlers dismissed both Rory Burns and Joe Denly within a span of one over. While the former scored 29, the batting all-rounder was dismissed for 20. 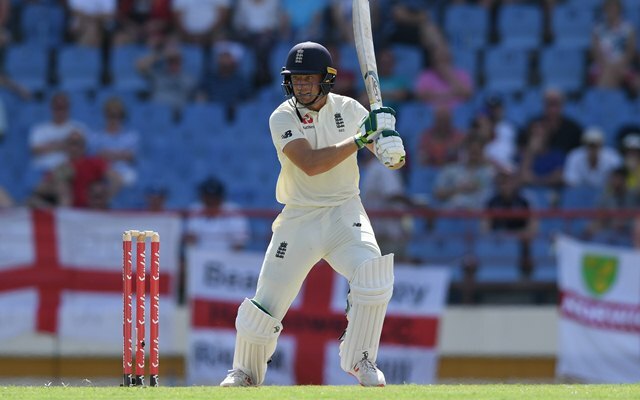 Skipper Joe Root registered another failure as he got out for 15 while attempting to play a rash shot. At 107/4, England looked in all sorts of trouble. After bossing the second session, the Windies failed to pick even a single wicket in the last session. A fightback from England, which wasn’t to be seen throughout in the series, finally came in the form of Ben Stokes (62*) and Jos Buttler (67*). These two added an unbeaten 124 runs together and both of them registered half-centuries. This is the first 100-run partnership for England in the series. But an interesting incident took place meanwhile. A mindboggling catch from Alzarri Joseph off his own bowling ended up dismissing Ben Stokes. The left-hander walked back to the pavilion and was removing his pads. But the umpires belatedly checked for a no-ball and realised that the bowler had overstepped. This would have been out a few years ago since the player has left the field of play. But, a new law which states: ‘in such a unique scenario, umpires can call back a batsman before the next ball is bowled’. Hence, Ben Stokes was able to resume the batting. Twitterati was thrilled as England put up a fight to finish the day on a high. But, the Windies fans believe that the team will bounce back strong. There was a lot of chatter about Stokes’ dismissal. I really hope Joe Denly solidifies a spot at 3. Burns, Roy, Denly, Root the Ashes top 4. I don’t like singling out players but Jennings CANNOT bat like that in test cricket 🙈. Same mistakes EVERY time. My respect for Jason Holder has grown even more if that’s possible. He made no excuses for the slow over rate. He said England also played 4 seamers and they got through their overs. He has taken responsibility for his team. A real statesman. #respect. Good from stokes and Buttler but though joe and Rory burns did so much to set that up today. Some joy for England with Jos Buttler and Ben Stokes showing resistance. A bit late – series already gone! Get the latest Cricket News and updates from Windies vs England series, Match Predictions, Fantasy Cricket Tips and lots more on CricTracker.com.